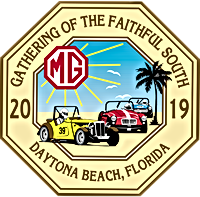 The 53rd Gathering of the Faithful South (GOF-South) to be held on April 11 through April 14, 2019 in Daytona Beach, Florida. We have Special Discount rates at the Ocean Front Host Hotel. Full details on the dedicated GOF-South on our website above. Extend your stay in Florida, enjoy our warm spring weather, and make it a Vacation. This was a great event - the cars, the people, the workshops, the drives, and the laps at the race track. Thanks to all who worked to make GOF South 2019 happen!